Thomas E. Perez, the U.S. Secretary of Labor, recently toured our farm in Oxnard, California, which was the first farm in the nation to be certified by the Equitable Food Initiative (EFI). Secretary Perez met with EFI and its stakeholders in order to learn about the program and how it leads to improvements in working conditions, food safety, and pesticide management. He met separately with farm workers to ask if the EFI program was actually making a difference in their daily lives. “I was heartened to see firsthand how this partnership of unions, consumer groups, growers, and buyers is working to invest in their workers and create shared prosperity. They reject the false choice that says you can either create value for shareholders or treat workers with dignity – they know they can and must do both,” said Secretary Perez. Other stakeholders on the tour included Costco, Whole Foods, United Farm Workers, Oxfam America, Farmworker Justice, and the Pesticide Action Network. 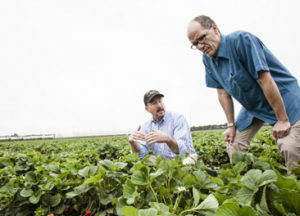 The farm that Secretary Perez visited is named Crisalida Berry Farm, which is owned and operated by Andrew and Williamson Fresh Produce (A&W). A&W is a stakeholder in EFI and also the owner of GoodFarms.